It could be a one pix line using the paint tool. That will introduce anti-aliasing into adjacent pixels. Thank you, but I know it wasn't that. I remember I used to do this with lineart vector sketch drawings where the lines varied between 10 pixels per line. 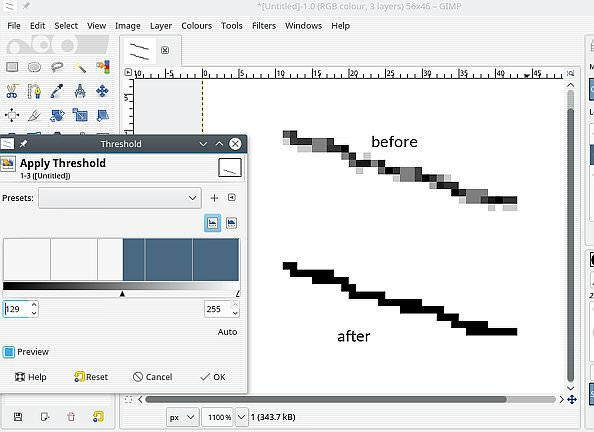 I used a tool to smoothen the line to have the same pixel thickness. Sorry I'm horrible at explaining. Thanks, but I never said Gimp does vector. And I don't draw vector, so I haven't really used Inkscape, but I'll look into it. And the Dilate filter doesn't even out the line. Only makes it thinner, like you said. I am quite aware of that tool though. @Ofnuts I'll try that. Thank you! Not quite what I was looking for, but at least I can use it to make a line even and then use Dilate to thin it out. (12-02-2018, 09:56 PM)CHJ85 Wrote: Thanks, but I never said Gimp does vector. so you didnt make these images you worked with yourself ? did you apply a centerline trace perhaps ? Right. But you misunderstood me. I used to edit victor pics (.eps and .ai files) in Gimp. Never said I did vector in Gimp. It's very annoying I can't remember how I did this. And I cannot believe it's this complicated. You would think it's a pretty common thing a lot of people need to straighten up uneven lines. When I google, people suggest all sorts of nonsense like using the blur tool, then sharpen and then ink it with Cartoon afterwards. For starters, that doesn't give a good result and might even mess the sketch up even more. Secondly, the way I used to do this was way simpler. The way I used to do it I believe was a 3rd party plugin. It would calculate the pixel difference. So for instance if the uneven lines differed between 1 and 5 px, it would convert it into a 3 pxs.